The thriller genre produces some of the most popular fiction in the market. It encompasses many subgenres, so readers can pick a different kind of thrill every time they visit the (online or real-life) bookstore. The elements all thrillers have in common are action, suspense, excitement, and maybe a touch of mystery. They are also all written by a curious species known as the thriller author. Who are these thriller authors? Where compels them to write such intense stories? Where do they get their ideas? Each month, we’re going to go Inside the Thriller Author. We are thrilled (pun intended) to have Jim Heskett as our first guest. He is a prolific author and has written the Layne Parrish Spy Thrillers, The Micah Reed Thrillers, and has even penned some Dystopian stories. 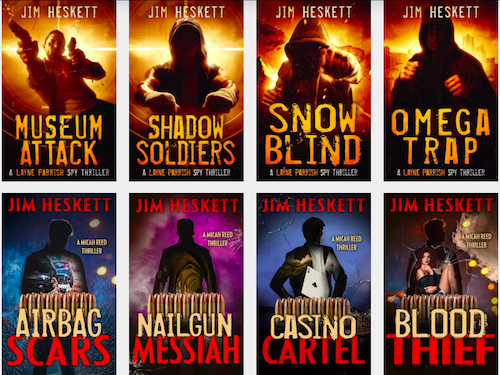 We ask Jim Heskett about why he wanted to become a writer, what fuels his writing, and how he builds his fan base one reader at a time. Read on! Jim Heskett was born in the wilds of Oklahoma, raised by a pack of wolves with a station wagon and a membership card to the local public swimming pool. Just like the man in the John Denver song, he moved to Colorado in the summer of his 27th year and never looked back. Aside from an extended break traveling the world, he hasn’t let the Flatirons mountains out of his sight. He fell in love with writing at the age of fourteen with a copy of Stephen King’s The Shining. Poetry became his first outlet for teen angst, then later some screenplays, and eventually short and long fiction, plus some dabbling in the video game industry. In between, he worked a few careers that never quite tickled his creative toes, and hasn’t ever forgotten about Stephen King. You can find him currently huddled over a laptop in an undisclosed location in Colorado, dreaming up ways to kill beloved characters. Writing is a labor of love. What made you want to become a writer? I’ve always been a storyteller. Ever since I got a gold star on a short story I wrote in the third grade, it’s been on the back of my mind. It didn’t come to the front of my mind until a few years ago, but, better late than never. Do you have a day job? How does it compare to your writing life? I did until recently. I’ve now taken the leap to full time writer. It took me a long time to figure out what I wanted to do with my life, but now, I can’t see any other means of spending my days than creating worlds and putting beloved characters in peril. Stephen King was your first writing inspiration. What is it about his writing that stands out to you? It’s the way he made me care about the people in his stories. That’s the whole key. Make the reader care, then make the reader worry the character isn’t going to get what he or she wants. That tension is what made Stephen King stories so much fun. What books are you currently reading? Who are your favorite authors today? Right now, I’m reading The Silent Corner by Dean Koontz. It’s an interesting techno-thriller. And, as always, a steady flow of non-fiction books about the craft and business of writing. Who is Micah Reed? What was your inspiration for this character? 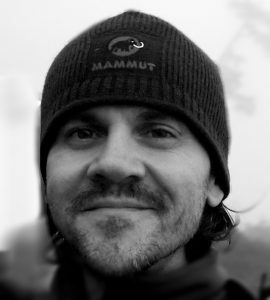 Micah Reed came from a desire to tell a story about a character with a mysterious backstory, that I could reveal in pieces over the course of several books. I’ve always loved stories where you discover new sides to people, good and bad. Micah came out of this idea I had about a former mob hitman who decides to atone for his past wrongs. The final version of Micah was a lot different, though. He became someone who had stumbled into working for a Mexican drug cartel, turned into a federal witness, and then entered witness protection. There was something about him having to always look over his shoulder that I thought would make for tense storytelling. You have an impressive backlist. How long does it take you to write a novel? What is your writing process? Thank you! It generally takes me about three months to write a novel, give or take. Some books require a little more time, depending on the amount of research. My Layne Parrish series, for example, usually takes longer, because he’s an international spy, and I don’t personally know much about being an international spy. I then research locations and technology and such to bring Layne’s stories to life. I’ve gotten my process down to a science. I even wrote a book about it, The Juggling Author. It’s all about how I write so much and balance all the other things in my life. Tell us about your upcoming Slave Games Trilogy. I’ve always been fascinated by dystopian and post-apocalyptic stories. The mystery box of finding out why and how the future comes to be the way it is. The Slave Games tells the story of a group of young people who have lived their entire lives inside the walls of a plantation in future former America, and they’re forced to play war game simulations by a wicked plantation owner. Except, one day, they decide to rise up, overthrow him, and then they discover the truth about what those simulations actually mean. What advice do you have for writers who want to begin writing in the thriller genre? Read, read, read. Learn the tropes in the genre and figure out what makes a good story good. Then, write. Write as much as you can, as often as you can. Your first book might not be great, but your second one will be better. And your third, even better than that. This writing game is all about practice, consistency, and persistence. Don’t ever give up. What marketing advice do you have for writers who plan to self-publish? As an indie author, I only get to spend a portion of my time writing. The rest is working on my business. My marketing advice is to build your fan base one fan at a time, and don’t be afraid to experiment until you find the people who will love what you write. What is your ultimate goal as a writer? In what way do you want to serve your readers? My ultimate goal is to make fiction people love. As a writer of thrillers, I’m not curing cancer. But, if I can give people an escape from the problems in their lives for as long as they can spend inside one of my books, then I’ve done my job. Thanks to Jim Heskett for sharing his writing life with us! 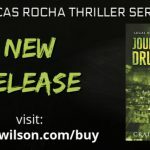 Are you a thriller author? Would you like to be featured on Inside the Thriller Author? 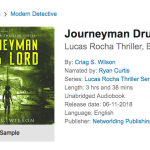 Crime Thriller Audiobook JOURNEYMAN DRUG LORD Released on Audible!